Left the hotel at 9.30 (despite getting up at 7.30 every morning it always seems to take ages to get breakfast, pack and leave). The dull cyclist from last night was on the front page of the local paper, apparently he had come to the town because he had a puncture - it must have been a slow news day. 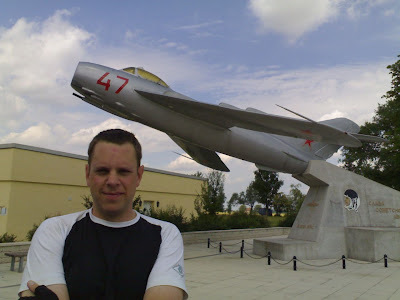 It was hot and sunny for the first time and we had a lovely ride in the morning with lunch in Grossenhain, where we also saw a Soviet fighterjet monument at a former airfield. 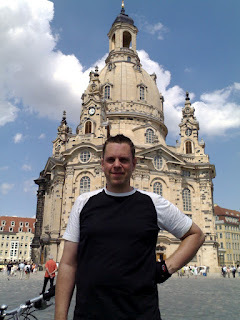 Continued to Dresden - the city is in the process of being rebuilt, more than 60 years after the war. The city was virtually destroyed by British and American bombing raids in February 1945, which served little purpose other than destroying a beautiful city and killing tens of thousands of people, mainly refugees. 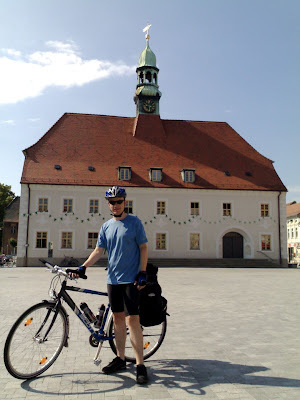 At Dresden we joined the Elbe cycle route, which travels from the North Sea to the Czech Republic (where is seems to fizzle out). It was very busy with a huge range of people, from families and pensioners, to racers and tourers like us. The landscape became very dramatic as the river wove is way between sheer cliffs, with the particularly impressive Konigstein castle perched on a rocky outcrop. At Bad Schandau James wanted to go to the spa, where there were a series of pools, both indoor and out as well as a salty one with dimmed lighting and new age music. There was also a sauna area which was clothes-free (not quite as bad as I thought, although don't think I'll be signing up) and included showers with settings ranging from 'shower' to 'forest', and a bucket full of cold water with a rope, which was very refreshing after the heat of the day!